"Super mums know what's right for one child may be completely wrong for another and treat intuition as a muscle and strengthen it with use"
THE definition of a mum is a woman who takes on the selfless and unconditional responsibility to nurture the emotional and physical well-being of her kids. And any woman who manages to do that successfully amid the chaos of running a household and often juggling a career has got to have a few tricks up her sleeve. Whether you proudly wear your super mum status like a badge of honor or you're looking to beef up your mothering skills, check out these tips from experts who've seen their fair share of super moms and are ready to give you the lowdown on the qualities it takes to become one. 1. Super mums know how to say NO. According to Susan Newman, Ph.D., social psychologist and author of The Book of NO: 250 Ways to Say It--and Mean It and Stop People-Pleasing Forever, super moms are adept at refusing those friends, relatives, and coworkers who take advantage of them and eat up their time and energy. They know the time they gain by saying "no" is used to complete the tasks they feel are important to them and to their children. 2. 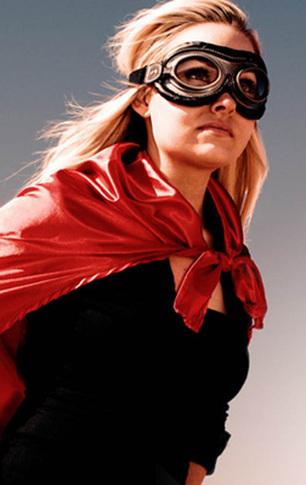 Super mums see when they need help. Genevieve Thiers, founder of SitterCity.com, has noticed that super moms recognize when they need help and don't feel pressured to do it all perfectly themselves. As simple as occasionally calling a sitter to come over instead of taking the kids with them to the grocery store, they know it's important to get outside support so they can refresh and recharge. 3. Super mums are loving yet firm parents. According to Sherene McHenry, Ph.D., LPC Professor at Central Michigan University, super moms set fair rules, assign age appropriate chores and hold their children accountable for their behavior. They know that helping their kids develop into responsible adults is the goal and friendship is the luxury. 4. Super mums work on their marriage. Professor McHenry notes that super moms understand that kids do best when they live in a home where the parents love each other. They keep the lines of communication with their spouse open and make their needs and marriage a priority. 5. Super mums cultivate friendships with mums of all ages. They understand that parenting is hard and there's no need to reinvent the wheel, notes Professor McHenry. They're open to the fact that moms who are older can cut down their learning curve, moms who are the same age can commiserate and moms who are younger will benefit from their wisdom. 6. Super mums trust their intuition. "Super moms know what's right for one child may be completely wrong for another and treat intuition as a muscle and strengthen it with use," says Success Coach Saundra Pelletier. Super moms seek advice but also consider the unique traits that make children individuals. 7. Super mums exercise understanding. According to Ms. Pelletier super moms know perfection is a fantasy and that missteps are an opportunity for change and growth. They understanding that their children will test boundaries in order to test consequences and that the key is to maintain an open, honest relationship. 8. Super mums appreciate the big picture. "If the table isn't set just right, or Johnny didn't know ALL the answers on his test, a super mum is able to step back and say sometimes good enough is just good enough and move on," says Kathy Buckworth, author of The BlackBerry Diaries: Adventures in Modern Motherhood. 9. Super mums know that delegation is key. Super mums believe that no one can do everything well, says Ms. Buckworth. They know that letting go and allowing others to take on roles they thought they had to do on their own is a good thing. 10. 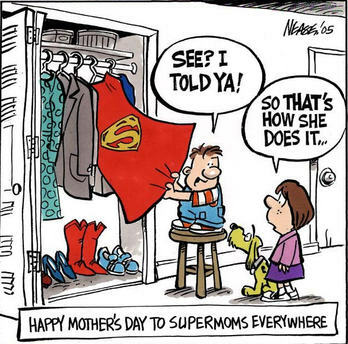 Super mums are spontaneous! According to Bob Dickson, a contributor to the book Chicken Soup for the Soul: Power Mums, super mums relish the opportunity to break free from the rigors of their strict schedules and indulge in an impromptu tea party with their kids. They take every opportunity to enjoy being a mum!